Oops - we don't appear to have a video for the ScanJet N6310. Manage all your office scanning – single or double-sided documents, bound reports, business cards, photos and even slides and negatives – from one versatile machine. Boost productivity with document enhancement and programmable shortcuts. Capture everything from single receipts to stacks of papers with this ultra-versatile scanner. Put an advanced document capture device at the heart of your business and get versatile image scanning from the same machine. Scan it all – stacks of papers, bound or stapled documents, business cards, photos, 35 mm slides and negatives. Streamline your scanning processes with easy shortcuts and automatic image enhancement features. Complete common tasks more efficiently with one-touch shortcuts. Use HP scanning technology to automatically deskew, crop and rotate digitised files. Choose colour-drop-out to improve OCR accuracy when turning documents into editable digital files. 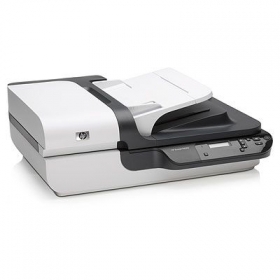 Scan multipage documents quickly and reliably with the duplex automatic document feeder.